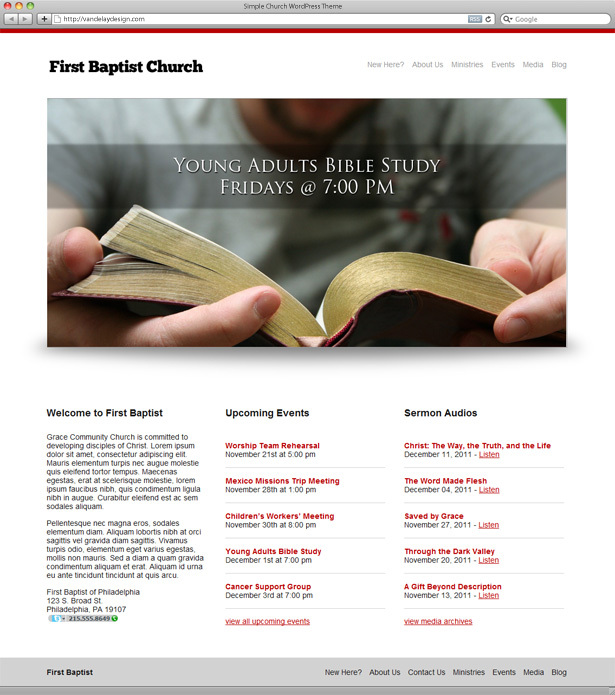 For churches that are working with limited budgets, free WordPress themes can be an excellent option. Our Simple Church WordPress theme will provide your church with a quality website that includes important functionality to highlight upcoming events and to offer sermon/massage audio files for visitors. The design of this theme is rather basic, with a white, black, and red color scheme. The theme includes a home page template with the image slider, an area for welcome text, list of upcoming events, and links to recent sermon audios. For the sermons or messages we recommend using a service like Amazon S3 to host audio files so they do not put a strain on your server, although it is not necessary depending on your host. The events calendar, an essential part of any church website, is easy to maintain. You’ll set up the events, including time, location, and any other details. As the dates and times of the events pass they will automatically be removed from the site, so you won’t have to manually delete them. The sidebar of pages and posts is set up to display the upcoming events for added exposure. The theme uses custom navigation menus (header and footer) so you can include links to any pages that you like. The header menu is set up for drop downs.